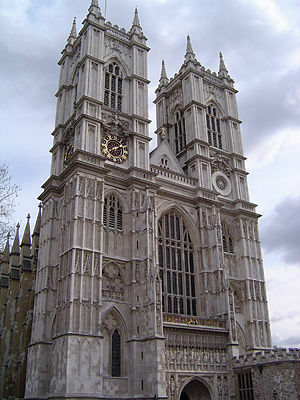 The Collegiate Church of St. Peter, Westminster, normally called Westminster Abbey, is a large, mainly Gothic church in Westminster, London, just to the west of the Palace of Westminster. 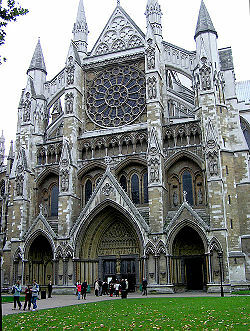 Neither a cathedral nor a parish church, Westminster Abbey is a church owned directly by the British royal family. Since the Christmas Day coronation of William the Conqueror in 1066, nearly all English monarchs have been crowned in the abbey. 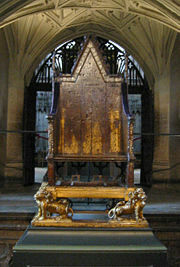 St. Edward's Chair, the throne on which British sovereigns are seated at the moment of coronation, is housed within the abbey. Due its connections to royalty, it was spared King Henry VIII's attack on monastic buildings during the Reformation. Many British kings and queens are buried within Westminster, along with other notable figures. For example, the tombs of both the Protestant Elizabeth I and Catholic "Bloody" Mary, along with the tombs of Geoffrey Chaucer, David Livingstone and Charles Darwin, are found within the abbey. Located next to the Houses of Parliament in the Westminster neighborhood of London, Westminster Abbey is a popular London tourist destination. With its oldest parts dating to the year 1050, the Abbey contains some of the most glorious medieval architecture in London. Tradition claims that a shrine was first built where the Abbey is now located in 616 on a site then known as Thorney Island, which became a place of pilgrimage after a fisherman on the River Thames saw a vision of Saint Peter there. The early shrine's existence, however, is not certain. The historic abbey was first built by Edward the Confessor between 1045-1050 and consecrated on December 28, 1065. Ironically, its construction resulted from the pious Edward's breaking a vow to go on a pilgrimage; the Pope suggested that he redeem himself by building an abbey. The original abbey, in the Romanesque style that is called "Norman" in England, was built to house Benedictine monks. It was rebuilt in the English Gothic style with Benedictine planning in stages between 1245-1517. The initial phase of the rebuilding was organized by Henry III as a shrine to honor Edward the Confessor and as a suitably regal setting for Henry's own tomb, under what would be the highest Gothic nave in England. Since the coronations in 1066 of both King Harold and William the Conqueror, nearly all English and British monarchs have been crowned in the abbey. St. Edward's Chair, the throne on which British sovereigns are seated at the moment of coronation, is housed within the west front of the abbey. Westminster School and Westminster Abbey Choir School are also in the precincts of the Abbey. Benedictine monks were required by the Pope to maintain a charity school in 1179. Westminster School may have been founded even earlier for children or novices, and the legendary Croyland Chronicle relates a story of Edward the Confessor's Queen Editha chatting to a schoolboy in the cloisters, and sending him off to the Palace larder for a treat. Henry VII added a perpendicular style chapel dedicated to the Virgin Mary in 1503 (known as the Henry VII Lady Chapel). The Archbishop of Canterbury is the traditional cleric in the coronation ceremony. Unlike most other English abbeys, the abbey was saved from destruction due to its royal connections, when it was claimed by Henry VIII during the Dissolution of the Monasteries in 1534. The expression "robbing Peter to pay Paul" may have come from this period when funds intended for the abbey, which was dedicated to St. Peter, were diverted to the treasury of St. Paul's Cathedral. Queen Mary restored the abbey to the Benedictines, but they were again ejected under Queen Elizabeth I in 1559. In 1579, Elizabeth re-established Westminster as a "royal peculiar"—a church responsible directly to the sovereign, rather than to a diocesan bishop—and made it the Collegiate Church of St. Peter (i.e. a church with an attached chapter of canons, headed by a dean). During the turbulent 1640s, the abbey suffered damage when it was attacked by Puritan iconoclasts, but was again protected by its close ties to the state during the Commonwealth period. Oliver Cromwell was given an elaborate funeral there in 1658, only to be disinterred in January 1661 after the restoration of the monarchy and posthumously hanged and quartered. His empty tomb, however, is still visible inside. Under the guidance of architects Sir Christopher Wren and [[Nicholas Hawksmoor], the abbey's two western towers were built between 1722 and 1745, constructed from Portland stone to an early example of a Gothic Revival design. Further rebuilding and restoration occurred in the nineteenth century under Sir George Gilbert Scott. Until the nineteenth century, Westminster was the third seat of learning in England, after Oxford and Cambridge universities. It was here that the first third of the King James Bible Old Testament and the last half of the New Testament were translated. In the twentieth century, the New English Bible was compiled at the abbey. As indicated above, since the coronations in 1066 of both King Harold and William the Conqueror, coronations of English and British monarchs were held in the Abbey. Henry III was unable to be crowned in London when he first came to the throne because the French prince Louis had taken control of the city, and so the king was crowned in Gloucester Cathedral. However, this coronation was deemed by the Pope to be improper, and a further coronation was held in the Abbey on May 17, 1220. The Archbishop of Canterbury is the traditional cleric in the coronation ceremony. King Edward's Chair (or St Edward's Chair), the throne on which English and British sovereigns have been seated at the moment of coronation, is housed within the Abbey and has been used at every coronation since 1308. From 1301 to 1996 (except for a short time in 1950 when it was temporarily stolen by Scottish nationalists), the chair also housed the Stone of Scone upon which the kings of Scots are crowned. Although the Stone is now kept in Scotland, in Edinburgh Castle, at future coronations it is intended that the Stone will be returned to St Edward's Chair for use during the coronation ceremony. January 4, 1243: Richard, Earl of Cornwall (later King of Germany), brother of King Henry III of England, to Sanchia of Provence (his second wife). Sanchia was sister of Eleanor of Provence, Henry III’s queen. Westminster is the site of some of England's most notable tombs. 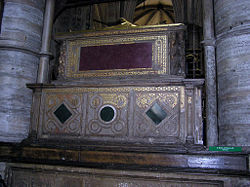 Edward the Confessor's relics were placed in a shrine in the sanctuary after Henry III rebuilt the abbey in the thirteenth century. Henry III himself was interred nearby in a superb chest tomb with effigial monument, as were many of the Plantagenet kings of England, their wives, and other relatives. Subsequently, most Kings and Queens of England were buried here, although Henry VIII and Charles I are buried at St. George's Chapel in Windsor Castle, as are all monarchs and royals after George II. In 2005, the original ancient burial vault of Edward the Confessor was discovered, beneath the 1268 Cosmati mosaic pavement, in front of the high altar. A series of royal vaults dating back to the thirteenth and fourteenth centuries was also discovered using ground-penetrating radar. Aristocrats were buried inside chapels and monks and people associated with the abbey were buried in the cloisters and other areas. 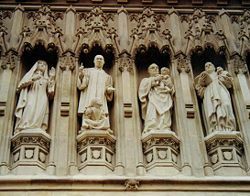 One of these was Geoffrey Chaucer, who had apartments in the abbey, where he was employed as master of the Kings Works. 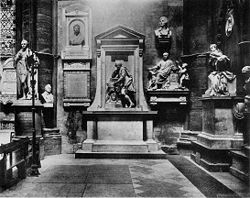 Other poets were later buried around Chaucer in what became known as Poets' Corner, as well as memorials to William Shakespeare, Charles Dickens, and other giants of literature. Abbey musicians such as Henry Purcell were also buried in their place of work. Subsequently, it became an honor to be buried or memorialized here. The practice spread from aristocrats and poets to [general]]s, admirals, politicians, scientists, doctors, etc. The abbey organ was built by Harrison & Harrison in 1937, with four manuals and 84 speaking stops, and was used for the first time at the Coronation of King George VI. Some pipework from the previous five-manual Hill organ was revoiced and incorporated in the new scheme. The two organ cases, designed in the late-nineteenth century by John Loughborough Pearson, were re-instated and colored in 1959. 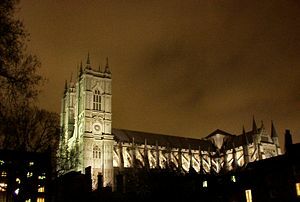 The abbey is a collegiate church organized into the College of St. Peter, which comprises the Dean and four resident Canons (one of whom is also Rector of St Margaret's Church, Westminster, and Speaker's Chaplain), and 17 other persons who are members ex officio, as well as 12 lay vicars and ten choristers. The 17 are the Receiver-General and Chapter Clerk, the Registrar, the Auditor, the Legal Secretary, and the Clerk of the Works (the administrative officers). Those more directly concerned with liturgical and ceremonial operations include the Precentor, the Chaplain and Sacrist, the Organist, and the (honorary) High Steward and High Bailiff. Lastly, the educational role of the abbey is reflected in the presence of the Headmaster of the Choir School, the Headmaster and Under Master of Westminster School, and the Master of The Queen's Scholars. The abbey is governed by the Dean and Chapter established under the Elizabethan statute of 1560. Quicktime Virtual Reality Panorama of Westminster Abbey Daytime Quicktime Virtual Reality Panorama of Westminster Abbey. ↑ The exceptions are Lady Jane Grey, Edward V and Edward VIII, who did not have coronations, and Henry III because Prince Louis of France had taken control of London. ↑ The throne was largely finished by the architect Henry Yevele in the reign of King Richard II. ↑ History Dean and Chapter of Westminster Abbey. Retrieved June 28, 2013. ↑ Coronations Dean and Chapter of Westminster Abbey. Retrieved June 28, 2013. ↑ Henry III. Archonotology.org. Retrieved June 28, 2013. ↑ National Pipe Organ Register., The British Institute of Organ Studies, 2005. Retrieved January 28, 2008. Panorama of Westminster Abbey – www.england-360.co.uk. A history of the choristers and choir school of Westminster Abbbey – www.ofchoristers.net. This page was last modified on 28 June 2013, at 22:36.